They nationalised their banking system and ceased international bailouts which have been so punishing for the population of Greece for example. They defaulted and wrote off a staggering $85 Billion in international debt. To me this is crucial not only for us, but the immediate stability our planet also. It is debt which is used by banks and corporations to enslave people and of course it has been holding the planet's ecosystems to ransom. It seems they're 'full of beans' now - I met with a lovely couple during my brief layover, who told me that during the recent "Panama Dodgy Investment Debacle", tens of thousands of people took to the streets with pots and pans in hand to oust the President for his dodgy dealings. Refreshing that the people themselves can make such a difference! I just love the signs and synchronicity on the road. I'd been feeling alienated by the 3D - a fair degree disempowered here by the density - such flowing magic happens constantly in higher frequencies. An inflight action adventure movie caught the slightly sombre drift - "Thor" being disempowered in the earth's density and feeling very human. It spoke into my challenges and soothed the pain - it transformed the feeling. And when I arrived here late at night, suddenly finding I'd somehow misplaced my dollars and had no taxi money to get to my hotel in the pouring rain, I recognised someone from the flight jumping into a taxi right in front of me - boldness caught the drift "going my way by any chance?" We had a great chat - turns out he's a really interesting guy - a DJ from Rekjavic. And as I came to say cheerio, you'll never guess what he introduced himself as.... "Thor!" 5GATEWAYS - Wake up Seattle! It's always great to have your pain recognised. It means the universe is taking note and caring. That's why I'm constantly encouraging people to get into their pain. When you do, you find the whole universe comes to reflect what you now need to work through. There is nothing - nothing at all - quite like being in the flow! So tonight is the Seattle 5GATEWAYS Seminar where I'm sure a bit of "Thor" thunder will stir up the vibes. If you can't be there in person, be sure to join through the ether. I'll send some flashes thundering your way! I'm feeling the spirit of Chief Seattle shining down on Open and Kim and everyone else gathering together on the west coast in one of my most favourite cities! I'm there with the rest of the light brigade including Cynthia and Trinity, flying free! Welcome back to the Pacific Northwest Coast Open! I'm waiting to hear back if there is still a spot open. My car broke down the other day, so if there is an empty cushion, I'll beam myself down via the Yankee Clipper. Seattle!! Geoff and I SO wish we could be there with all of you. We know you will have the BEST of times. I have felt it building for awhile... especially now with the energies moving around and through. Can't you just feel it? Sparks in the air. We will be following along with you, Open - in our meditations and prayers as we surrender even more into life here. Hugs all around from both of us. There may well be one place left Sandra - but I won't know until Kim gets here later today - it would be lovely to have you along. I'll ask her to contact you. Thanks so much Jan - looking forwards to crossing the waters for the weekend. Having read this post, I watched an episode of sitcom 'Friends'. The seminar went wonderfully - a lovely group of people who connected especially well with the work - plenty of tearful eyes and sense of home coming. That's what I love about doing these - people consciously committing to the spiritual path and all that that entails. Often you're living in a sense of isolation with those around not getting it; but when you realise you're a part of a much wider family of ascending people, that makes it all worth while. Just been enjoying a pleasant day's break here in sunny Seattle before it all kicks off with the retreat on Monday. Whereupon we have a full house - 16 people travelling from all across North America to be here. I can feel in my bones it's going to be a good one! Kim and myself just arrived last night at the 5GATEWAYS retreat here off the cost of Seattle on a beautiful forested island. We're so blessed - the Harper's Hill Retreat is stupendous! A secluded 10 acre patch of forest, with lovely wildlife, beautiful trails and fantastic accommodation and purpose built studio - thanks so much to Missy for finding it. We're going to have such a fantastic time. I can see this becoming a regular venue for 5GATEWAYS retreats in America in the future. I'll keep everyone informed how it's all unfolding during the week. Well we're having a stupendous time here in Sunny Seattle at the beautiful Harper's Hill Retreat Centre - I can feel we're going to be back here plenty of times! When you're relaxed and removed from it all, it's amazing how quickly surrender happens and a deep unfolding into those repressed inner layers. We're winkling out lost aspects of soul and reuniting with the soul's mainstream within. It feels just like coming home! And funky accommodation - where are the Hobbits? The Bamboo Studio - feels like Bali! And here are the Hobbits - getting down to it! "Reality? It's kinda like this..."
That's just too energetic for Erica - "how about we do it like this?" Is it a bird? Is it a tree? No, it's Treebrother! And after all that work, whose the most popular man in town? Yes, it's Christopher, the conscious cook! Stay tuned folks, we're having a great time and expanding lots of consciousness. I love these photos! And what a beautiful retreat area...my kind of place! I could feel the energy from here! What a magical week that was! I am deeply grateful for meeting you ALL. We have co-created a bundle of energy and I felt it wanted to flow through me most of the time. This strange new sensation kept me awake for 3 out of 4 nights, so I can now add "sleepless in Seattle" to my life experiences. I found myself looking at the moon and stars, smelling the white flowers in the middle of the night, pondering the intelligence behind this mysterious flow. And I thought to myself, what a wonderful world! My greatest take away from this retreat is a question: When do I allow the energy to flow through me and when do I say “stop, it is time to rest”. I always feel like allowing and that somehow things will be all right, but then at times the energy makes me feel shaky and overwhelmed. So perhaps it is more about working with it and allowing throughout the process and less about giving a permission at the beginning of it? Another question that wants to be asked is: what is it really that makes me tired? Is it the lack of sleep or the resistance to not sleeping? Journey well, my fellow Travellers. Let us be gentle on ourselves. Slow down each day and provide the space to connect with the newly found presence. Allow a safe passage for your feelings in their full rawness. They do not need to be fixed, transformed or even understood. They just want to be held and lead you to the buried fragments of your soul that long to come back home, to You. Kim: Heartfelt thanks to you for organizing the event and mostly for your very special, warm, and encouraging presence. It allowed us all to dive deeper into the vulnerability. Christopher: You rock! 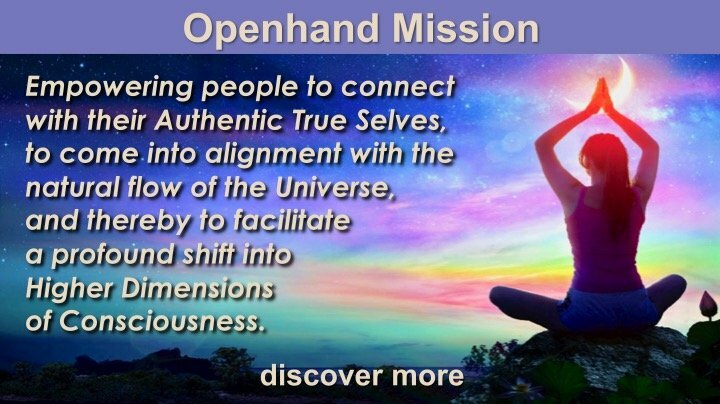 I hope you'll join the Openhand community and we'll see you again in person or on a forum. Open: Big bow to you for being there for us 100%, thank you for bringing such profound alchemy to each moment (how do you even do this?!). I miss you all so much. Thank you Open and everyone else for being part of such an amazing, magical retreat! The energy of the retreat is definitely still flowing through me, creating shifts. On the second leg of my trip home the woman sitting next to me asked about my trip. All I said was I was at a meditation retreat. She started asking questions and we talked the entire flight. Towards the end of the flight I shared that I was trying to figure out what my true calling is. Her response literally moved me to tears. She said "You are already doing it. I feel so much better after sitting next to you and talking with you." I was overwhelmed. I was not trying to do or fix anything for her. All I did was come from my heart and be fully present with her during our time together. The airline had changed my seat on that flight without asking me if it was ok. I wondered why but didn't question it. Now I know it was the flow bringing us together. I may have helped her but she gave me an equally beautiful gift. Thinking of you all and looking forward to seeing you all again soon! Wow what a wonderful week - it's just so lovely for me when people make such a commitment to the work and the process. It connects us as a 'tribe' and takes us really deep really quickly. Then miracles and magic just flow from that space. We shifted quickly into Fifth Density being. That's what makes it so special. And when you leave, yes the density will likely creep back in, but by using the Openhand Spiritual Compass we worked through, you can keep working into the density and peeling it away. Then even in the densest of vibrations, you can keep coming up smelling of 5D roses! WOW! WOW! WOW! The force is strong young Jedi! :) My trip home the magic was everywhere! First we were a little late leaving as Margret had to catch the ferry so we were not sure we would make it in time ..but of course we walked right on and the time was perfect.... At the airport Ann and I had the most soul connecting conversation I felt like I really made a lifelong connection those few hours before boarding the plane. Smiling to myself and silently thanking the Universe for these messages I look over at the person next to me reading a book and the words jump off the page "Bringing you that much closer to what you want". ....Ok now I'm feeling like Im in an alternate Universe..everything I look at is speaking to me Im laughing and crying at the same time in total Awe of this experience!! This in incredible! BTW I'm reading 5 Gateways as all this is happening.. The energy is coursing though my entire being I want to get up in the plane and dance, jump up and down and yell "This is a Magical Universe!!!! Wake up wake up wake up!!!!! The next thing I see is on the screen of the person across from me UNLIMITED OPTIONS AVAILABLE ....WELCOME ABOARD! Now I just accept with immense gratitude that I am in the flow my soul is speaking directly to me and I'm totally tuned in. i close my eyes and surrender to the amazing energy flow I'm feeling in my body. As we land and are getting ready to exit the plane the little boy in front of me catches my eye ..we lock eyes and I smile. He says "hi" I respond and ask him if he liked the plane ride. He says "yes! I got to watch a movie with my favorite song. What song is that I ask? He starts to sing.. the wheels on the bus go round and round.. I know this song so I sing with him "The wheels on the bus go round and round, round and round, round and round, the wheels on the bus go round and round all through the town. Everyone around us is laughing! I realize then the entire energy of everyone around us has increased and everyone is smiling, laughing and being very gracious to one another instead of the usual pushing to get off the plane as fast as possible. Again I send gratitude for the incredible experience I am feeling..... As Im getting off the plane the sign before the exit catches my eye..."Thank you for paying attention"
Thank you Open for teaching me to Pay Attention! Open was absolutely brilliant, inspiring souls to go deep on the journey we participated in together. I am grateful to each and everyone of you for bringing your full selves and having the courage to express you. Watching and feeling the transformation of souls during these courses fills me with so much joy and aliveness. I am grateful to serve and be a part of it. At times the love inside is so intense it feels my heart may burst. The interplay with the universe is so beautiful, it keeps bringing me to tears. I don't want this feeling to end. A sense of trepidation creeps in when I think of entering back into the density of life but it's a false shell and not fixed. There is nothing worth trading this feeling of connectedness. I know to just keep fine tuning, softening, allowing and expressing. Each moment being new, allowing myself to move from that space. This sense of will rises up to express me at all costs, seeing the masquerade. My plane flew over the Grand Canyon while I was watching Everest reminding me of this epic journey of ups and downs. My excitement builds at the metaphor of the challenges ahead as I feel myself sailing through the space between. Keep digging for the nuggets of soul gold and shine on my fellow travelers. Wow - such beautiful, soulful sharings here! I feel so blessed to be part of this gathering. So much of the journey for me of late has been to open to the realities of what is happening on our planet - not to simply make the personal changes and then put the blinders on, but to truly feel how I feel in response to what is happening. So many beautiful messages, and the most poignant one came in the form of the second silver spoon I found this week. This spoon was meaningfull in so many ways - but one of them was that it was inscripted with silver roses all down the stem. Just that morning, Erica, Kim and I had walked along the sea and smelled the most amazing white roses...commenting that it was strange to find a rose hear in this place - and realizing it was planted with purpose...finding this rose engraved spoon, brings such a sense of connection and support...the silver thread of connection to soul family that seemed to pierce every cell with a silvery musical vibration...like a high pitched tuning fork. (or spoon hahahah). Also having lately felt how supported I am in being the open flower but am I also being the stem,planted in the ground?...and now this stem with flowers all the way down felt like such loving confirmation. The journey home was one of opening through the dissonance...watching the Heart of the Sea - the journey of the whaler who comes eye to eye and heart to heart with the impacts of our human distortions. A part of me wants to turn away and cocoon myself from the heartache of it all...Stopping on the way home from the airport to sit by the ocean...the place I am pulled to is littered with noise and tension...I go to put on my ipod and meditate, but alas, it isn's functioning...so now to just open to the gift of it all...sit there and hear it, feel it and find me through it...incredible! It's amazing how strong I can feel who I am through being in environments that stirs up inner conflict...like the light in the dark and how apparent the stars are when all the lights are out. I did pick up a hitchhiker tick along the way...and had an interesting exploration with my vacuum today...something going on with sucking up energy perhaps. You are all so incredible and unique...just love the dance of seeing the multitude of reflections...stirring up what's unconscious within and bringing it to the surface as we recognize ourselves in the other. Each of you touched something deep within. So much love for all of you! Open, Kim and M! What can I say, but you are each such precious gifts - holding the space, catalyzing the realization of who we truly are, supporting with presence, grace and supreme insight. I love you all! Overflowing with love and gratitude, Thank you! I could fill pages with all the dynamic shifts through self realizations. Seismic activity breaking through in multiple densities on various planes. Open, thank you for blazing a trail while simultaneously orchestrating an alchemy of energetic harmonious breakthrough symphony of souls expressing authentically! Kim, Jen and M, so grateful for your dedication as facilitators. Each blessed with gifts from beyond allowing light to shine and shimmer radiantly. Thank you to everyone for each and every reflection.. I admire the vulnerability beyond words!! Wow - what an incredible journey this has been!! Feeling the intensity of the pull to attend the retreat only days prior to it beginning, I hopped on board at the last moment. There is no denying the fact that I was meant to be there. I have attended Openhand coursework in the past, however this was the most catalytic experience for me to date. I journeyed into the depths of past life karma, through layers that have been buried deep in my soul's cellular memory. I felt the excruciating pain of existence, and the profound presence that resides beneath this. Thank you Open for taking us on this journey, for surely we could not have ventured there on our own. What stands out for me is a deeper sense of knowing that I am not this experience. The freedom I feel from knowing this has ignited and illuminated the fire in me. Just prior to wrapping up the retreat I experienced assisted soul motion with Margaret. My body began moving into waves of density within my field. I flowed through them like a ship gently breaking through the swells of the sea. When my body came to a place of stillness Margaret gently asked me to feel into my current state. The sense of peace and emptiness was profound, and what expressed from me was pure magic. I started to laugh, and the laughter continued to escalate and express from a place deep within me. I laughed like I have never laughed before. I was resting in the absolute joy of my soul. To my fellow soul travelers - deepest gratitude to each and every one of you. I felt a soul connection with all the participants like I have never felt before. We were incredible mirrors to one another in so many ways. Margaret and Kim - your presence was felt on so many levels. Thank you for holding the space for this intense and profound work. And to Kim, thank you for all the work you undertook to make this retreat possible. Open - The gratitude I feel towards you and the work you do is difficult to put into words. You truly are a bridge in guiding souls on the path from the old world into the harmony that is unveiling in the new world, a world where we experience the majesty of our true beingness and the wondrous depths of our soul. The signs and synchronicities have been ongoing and awesome. Yesterday as I sat on the shore of the sea I watched two birds play together in flight as they rode the wind currents. One was a black bird and the other a white seagull. My darkness and light can dance and interact beautifully at this time. The are both grace and clarity in motion, guiding me on my path towards home. You are all such special people. Here's a Seattle 'roast' to you! On my way back from Seattle I was given a large window seat with lots of leg room, but due to an error on my part my suitcase did not make it home with me. I wondered why I had created this and asked the universe, "show me". The answer quickly came, YOU LEFT YOUR BAGGAGE BEHIND. Love the photos, shares, and beautiful energy of all you amazing and magical periwinkle trailblazers! You Guys look so Radiant!!! !